Produkte: DAF Trucks N.V. is one of the largest truck manufacturers in the world. Our core activities are focused on the development, production, marketing and (after)sales of light, medium and heavy duty commercial vehicles. DAF has modern production facilities in Eindhoven (Netherlands), Westerlo (Belgium), Leyland (UK) and Ponta Grossa (Brazil) and is supported by more than 10.000 employees worldwide. All our vehicles are built to meet the individual specifications and transport requirements of our clients. We offer a wide range of services – from 24/7 truck service to driver training and financial leasing. We understand that efficient transport involves more than just the perfect truck. We develop state of the art technologies, to implement in all our trucks. DAF also produces components for third parties, ranging from axle assemblies to complete engines for buses, coaches and special vehicles. Praktika: Our internships and graduate projects offer you the opportunity to develop yourself as a professional in the Automotive industry. Every year more than 150 (international) students, start their internship or graduate project at DAF. You can play an active role in one of our projects or participate in the field. 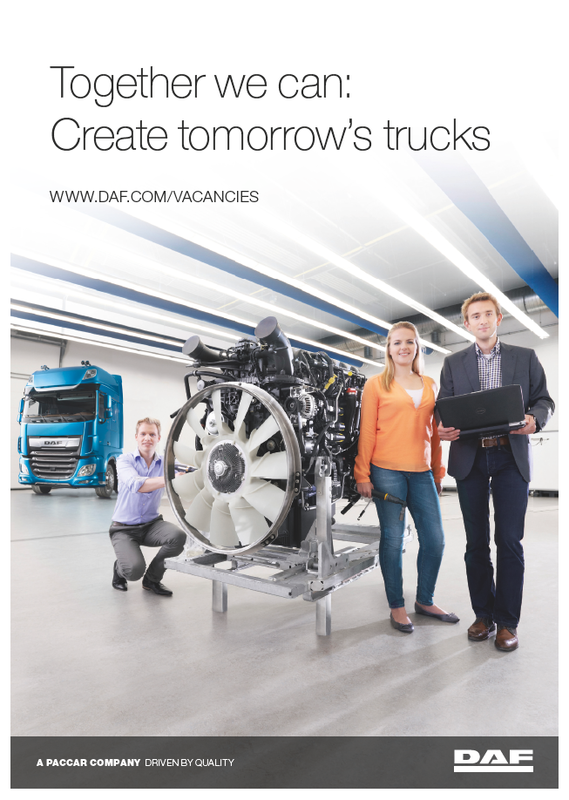 DAF offers career opportunities in Engineering & Manufacturing, Product Development, Quality, Logistics & Supply Chain, Purchasing, Finance, HR, IT and Marketing & Sales. Studien-/ Diplomarbeiten: There are several ways in which you can apply for an internship or graduate project with DAF. First, you can respond directly to an internship or graduation project advertisement on our website. Go to the „Student“ section to see which positions are currently available. To apply for a position, please fill in the online application form. It is also possible to leave an open application. To do so, please fill in the online open application form. As soon as a new internship or graduation project becomes available, we try to link it to students in our database. In addition to your CV, it is important to send a detailed covering letter, which clearly states the period you are available and what kind of project you would prefer.